Why do I need to prepare my USB pen drive for WinPE ? Some USB pen drives are shipped without a master boot record (MBR) and with just a single partition. In order for the USB pen drive to be used as a boot device, it will require an MBR. Formatting the USB pen drive using the standard Windows format option will not prepare the disk correctly by creating a master boot record. You will need to prepare the USB pen drive using other tools, e.g. Windows diskpart. What steps do I need to perform to prepare the USB pen drive ? There are many tools available that can perform this process but we will focus on the free Windows tool diskpart in this article. 1. Run a command prompt session as an elevated user. Do this by clicking Start > Run > type in cmd and then hold and press the following key combination left shift + left control + enter (For further information see here). 2. Type in diskpart and press enter. 3. Type in list disk and press enter. 5. Type in select disk <n>, where <n> is the number of the disk previously identified as being the USB pen drive. In the screenshot above, it can easily be seen that disk number 6 is the one we are after. Confirm that the current disk selection is correct by typing in detail disk, this will show information relating to the currently selected disk. 6. Type in clean. This will erase all data on the USB pen drive. 7. Type in create par primary. This will create a primary partition on the USB pen drive using the maximum size available. 8. Type in active to make the primary partition active. 9. Type in format FS=FAT32 LABEL="Macrium WinPE" QUICK. 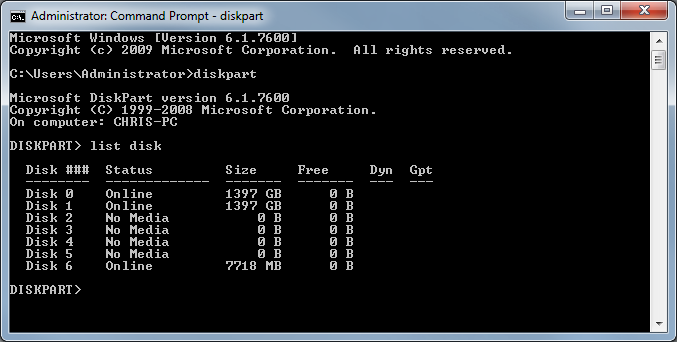 This will format the newly created partition on the USB pen drive. 10. Type in exit once the format command has completed to exit diskpart. 11. Type in exit again to close the command prompt session. Article has been viewed 21,197 times.